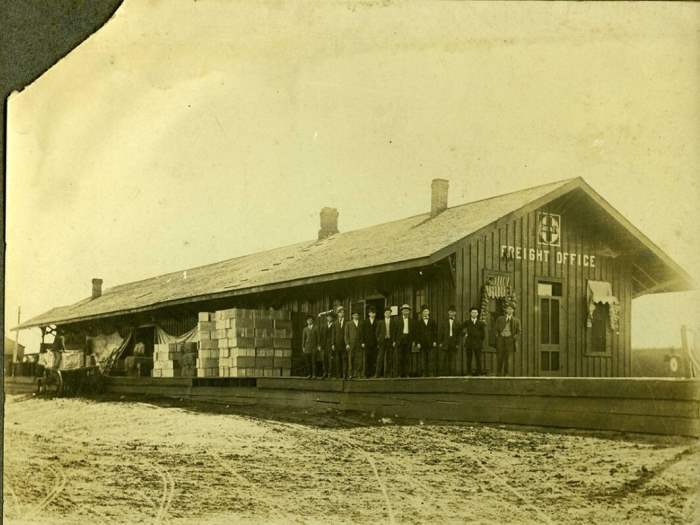 I am trying to locale a "Santa Fe Freight Office" as shown in a photo I have, It may be Milano or Temple, TX. dressed in suits and hats on the platform. The photo shows the dock side, not the track side. If so, I shall come down to see the photos. Commission and hopefully you will be hearing from some of them. and my email would not go thru. If Mr Nichols reads this, and wants a response, I ask that he disable this filter so emails can go thru. I will examine the photos you sent tomorrow to see if there are any similar ones. for assistance on your inquiry. reply is pending from Mr. Bert Dockall, the Rockdale Station master, to see if his resources may have a match. Also a Mr. Barkley Lagrone, and his brother Claude, have books containing photo's of older Santa Fe depots. to Mr Barkley Lagrone to see if there might be a match in his book. I'll advise if I receive information. the location of the depot in the photograph. have books containing photos of older Santa Fe depots. be one and the same. Unfortunately, I didn't see a depot that matched your photo. success in locating the city of your station/Depot. contact the Temple person, Mr Ordner, upon my return to Dallas later next week.